Clusters of galaxies are the largest objects in the Universe which are held together by their own gravity. Groups of clusters of galaxies (known as super-clusters) did not have enough time to reach the equilibrium, and hence are formed by a collection of cluster gravitational potential wells. 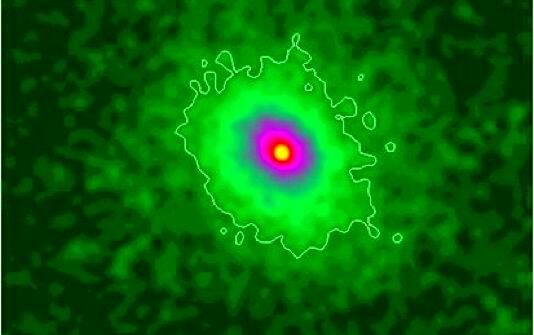 Clusters typically contain 100s to 1000s of galaxies, spread over a region of roughly 1025 cm. Their total masses exceed 1048 g.
The first detailed analysis of these massive structures was performed by M. Wolf in 1906, although the tendency for galaxies to cluster on the sky had been noticed long before this. A great advance in the systematic study of the properties of clusters occurred when G. Abell, in 1958, compiled an extensive, statistically complete catalog of rich clusters of galaxies. Representation of the gravitational potential well of cosmic structures of different sizes. the remaining ~70% is an unknown form of dark (i.e not emitting nor interacting with electromagnetic radiation) matter. 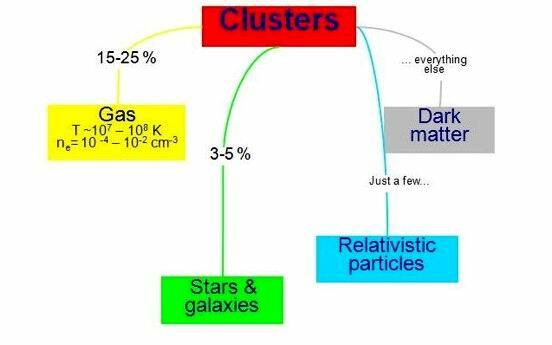 Matter content in galaxy clusters. Stars and galaxies, which emit at visible wavelengths, and hence observable with optical telescopes, make up only for a few percent of the whole mass content of clusters. 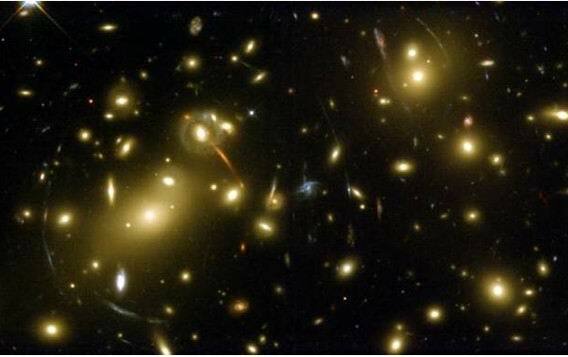 The two panels on the right show the optical images (taken by the Hubble Space Telescope) of two rich Abell clusters. 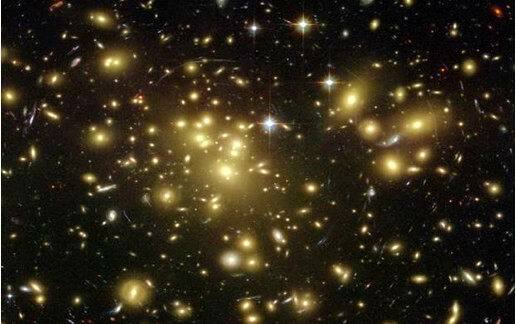 Galaxy cluster Abell 1689. Image taken by the Wide-Field Planetary Camera 2 (WFPC2) on board of the Hubble Space Telescope (HST). 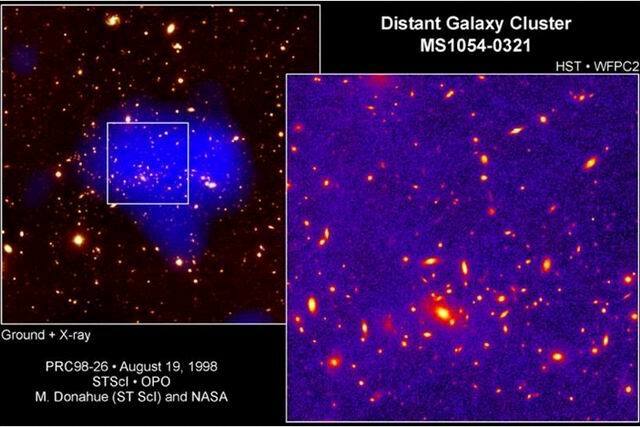 Optical images of the galaxy cluster MS1054-0321. The smaller region covered by the HST (on the right) is shown as a white square in the left panel. The X-ray image of the cluster is superimposed in blue in the left panel. At X-ray wavelengths clusters of galaxies appear much different than what they do in the optical. The emission from single galaxies, that dominates optical images, is often barely visible in X-Rays; at these short wavelengths, the main source of emission comes instead from a hot, diffuse gas, trapped in the cluster gravitational potential well, which is primarily influenced by the distribution of the dynamically dominant missing mass component. Evolved clusters in hydrostatic equilibrium with deep, regular potential wells, show regular, centrally condensed X-ray structures, with smooth X-ray distributions. The hot intra-cluster gas offers the possibility to estimate the shape and the size of the emitting cluster and, at the same time, provides the unique chance to detect and to characterize clusters up to large distances. 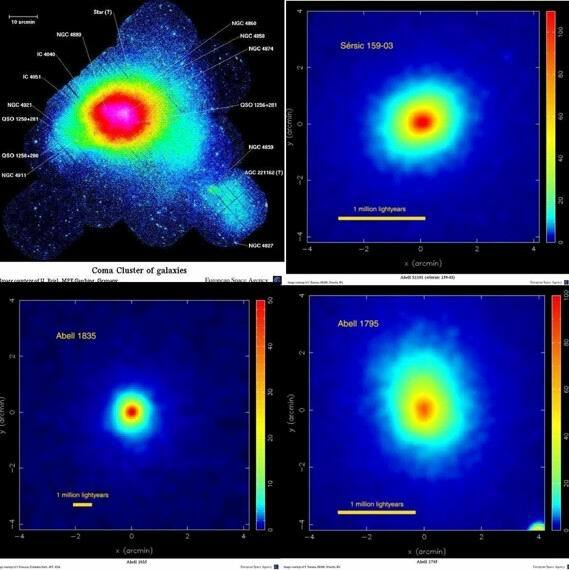 Images in false colours of four clusters of galaxies in X-rays. Colours from blue to red are propotional to the intensity of the X-ray emission. 1959 Limber suggests that diffuse gas must be present among galaxies, and clusters be filled with a hot diffuse gas component. 1966 The first detection of an X-ray source associated with a cluster of galaxies came from Byram et al. They detected M87, the central giant galaxy of the Virgo cluster. The two types of emission mechanism proposed are: thermal bremsstrahlung from a hot isothermal gas sphere and inverse Compton radiation from the interaction between the 3°K microwave background photons with a population of relativistic electrons in the cluster. 1972 A first indication about the nature of the diffuse cluster X-ray emission came from Solinger and Tucker, with an early indication of a correlation between the X-ray luminosities of clusters and the velocity dispersions of their member galaxies. Such a correlation is naturally expected if the gas is thermalized, in equilibrium with the cluster gravitational potential, and the emission mechanism is thermal bremsstrahlung. 1976 The thermal origin of the X-ray emission was finally demonstrated with the Ariel V detection of the 7 keV Fe line in Perseus and Centaurus by Mitchell et al. This demonstrated the presence of a hot gas embedded in the cluster gravitational potential well, at ~6 keV. 1976 The Einstein IPC observations of Jones et al. further revealed several clusters with complex X-ray morphologies. The close correspondence between the X-ray emission and the galaxy distribution was interpreted as evidence for equilibrium of both the IC gas and the cluster galaxies in the cluster gravitational potential. 1977 Mitchell and Mushotzky produced the first relations between the X-ray temperatures and velocity dispersions of clusters. These relations looked consistent with what expected if the X-ray emission was produced by an IC gas in equilibrium with the gravitational potential traced by cluster galaxies. 1980 Schwartz detected X-ray emission from poor clusters and compact groups. What is the origin of the Intra-Cluster Gas (ICG)? The two most accredited explanations are the following. 1. The ICG once resided in galaxies and was later removed and dispersed in the intra-cluster space by means of collisions, galactic winds driven by supernovae or ram pressure stripping. This would explain emission lines due to Fe, Ni and other heavy elements seen in the diffuse X-ray emission of galaxy clusters. Furthermore, galaxies in the cores of rich clusters are often observed to be deficient in HI gas, favouring the scenario that gas stripping in galaxies has indeed occurred. 2. The gas is primordial, originating at the time of cluster formation. Galaxy formation from the primordial gas cannot be 100% efficient; residual gas is consequently left lying within the galaxies. This would explain why the total mass of the ICG is much larger than the sum of the mass of the single galaxies. It would otherwise be difficult to understand how so much material could have been stripped from galaxies. The truth lies in the middle. Large part of the ICG is of primordial origin; a smaller portion (gone through star formation processes and hence more metal rich) has been instead stripped or ejected from galaxies. The ICG is mainly composed by Hydrogen and ~10% of Helium. It is extremely hot (TICG=106-109 K) and under-dense (with electron density of ~10-3 cm-3). Under these conditions, the ICG is almost completely ionized and its status is described by the ‘coronal approximation’ discussed in Lecture 5. Interaction with the Cosmic Microwave Background Radiation (CMB), also known ad Sunyaev-Zel’dovich Effect (SZE): ~1% of CMB photons passing through a cluster scatter (inverse Compton scattering, see Lecture 3) off hot electrons of the ICG. Scattering transfers energy from the hot electron population to the low energy microwave photons. For low frequency receivers galaxy clusters appear as cool spots in the CMB. 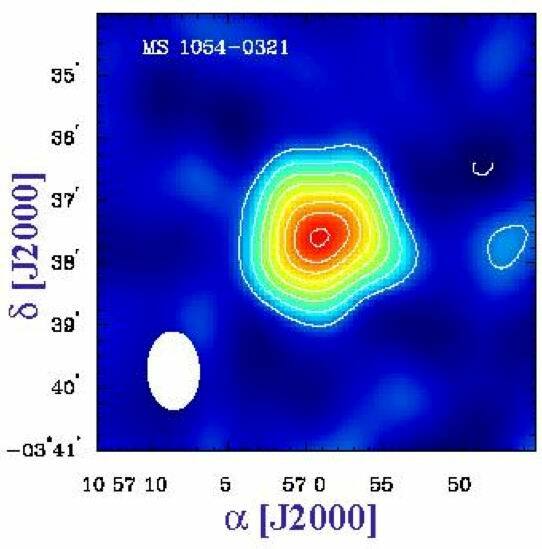 SZE image of the galaxy cluster MS1054-0321. The image shows the temperature decrement of the CMB towards the cluster centre. In general, the elastic collision times for ions and electrons in the intra-cluster gas are much shorter than the time scales for heating or cooling or any dynamical process, and the gas can be treated as a fluid. For a more realistic treatment one should take into account both nearby and distant collisions. In passing through a field of ions, an electron will have many encounters simultaneously, with various impact parameters and directions. The cumulative effect of the many small angle collisions is often larger than the effect of the few large angle collisions. The mean free paths are hence much shorter than the length scales of interest in clusters (~1Mpc) and, as a consequence, the ICG can be treated as a collisional fluid. A second valid assumption, is that the ICG is in hydrostatic equilibrium because in most clusters the sound crossing time tsound (the time that takes a sound wave to cross the whole cluster) is shorter than the life of the cluster tcl (~1010 yr). motions in the gas are subsonic. where μ is the mean molecular weight (an estimate of μ in galaxy clusters, will be obtained in the next slide). Under the above conditions, the ICG can hence be considered to be in hydrostatic equilibrium. In what follows we provide an estimate of the mean molecular weight of the ICG, under the physical conditions of a typical cluster. We also show how this value can be obtained.